Today we woke up to this- blood in the white of Nate's eye. 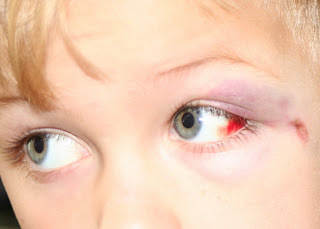 I'm sure it's nothing and will heal on it's own, but he will have to go see the eye doctor just to be positive there is no damage back where we can't see it. I'm pretty sure he's testing me to see just what it takes to break me. How did he get the black eye? It looks really painful. I am glad you are taking him to the doctor. Yesterday, I almost ask if you had his eye checked, then reassured myself that you would do so. See, I don't always nag. When you girls were little, you each had a black eye before you were two -I am not sure Mike ever had a black eye- only my girls!! Anyway, I was told by a doctor that I should always have black eyes checked to make sure there was no unseen damage. Then you will be pleased to know that it is indeed just a broken blood vessel and he is expected to be completely fine within 2 weeks.